You may have not noticed this, but the images have a huge impact on website speed. Usually images occupy most of the memory space, causing a web page to load slower than usual. As a result, optimizing images usually saves a lot of memory space and improves the performance of your website. The smallest is the size of an image, the lesser memory it uses and thus increases the speed of a website. In this article, we will show you how to optimize images to speed up your blogger site. While saving images, you need to be sure of the image file format and compression. If right combination is used, you can decrease the image size significantly. On the internet, the most common image file formats are PNG and JPEG. Both file extensions has its own specialty, JPEG is used when your image has lots of colors and PNG is used for simple images having transparent backgrounds. For those who are unable to find a different, yet, JPEG applies compression on images, making the size of the image much smaller but slightly compromises on image quality. Whereas the PNG format is uncompressed, providing higher image quality. Page load speed matters a lot for Search engine so to guarantee that images don’t hurt your site load time, make sure the image file size is as small as possible but do not compromise on quality. However, keep in mind decreasing the width and height of an image using CSS does not reduce the size as the original image is still loading with the same file size. The next thing is compressing images with the help of tools to get an image optimized for web. 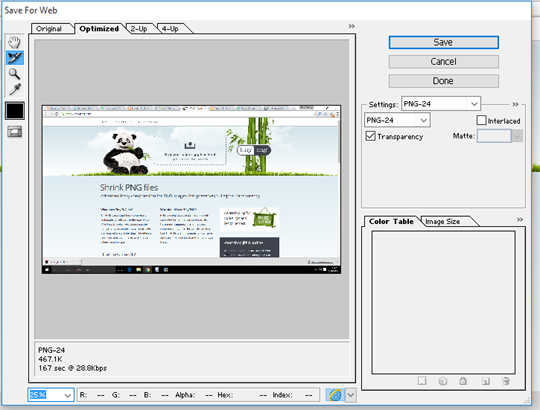 TinyPNG uses smart techniques to compress the file size of your PNG or JPG files. All you have to do is to go to TinyPNG.com, upload your image file, it will compress the image and provide you a download link. The best thing is the it’s FREE. They also provide a API that can be useful for developers to automate the process with ease. It is a professional image editing and creating tools that allows you to save an image optimized for web. To use this feature, open your image on Photoshop >> Go to File >> Save for Web & Devices. This will open up a new window, you can change the image format according to your likings. There are many quality options as well, which can decrease the image size. It display’s file size on the bottom allowing you to setup image according to the desired file size you need. This is another online image optimizer that uses a smart combination of high quality optimization and compression algorithm to reduce the JPEG and PNG images to the minimum size while maintaining the quality. You can upload up to 20 images on a single go, making it a lot easier for you to convert multiple images. To be honest, At MyBloggerLab we were not using compressed images due to which we were having our site slowed to about 50% due to large images. Therefore, if you are not saving images optimized for the web then this is the right time to start doing. It can make a big change in your site speed. You have to slightly compromise on the image quality, but it would be non noticeable. We hope this article helped you to learn how to optimized image to speed up your blogger site. If you have any fellow bloggers who is not using the optimized images, send this article’s link to them. If you have any thing to say, feel free to leave a comment below. Previous articleHadoop What is it and why does it matter?